The beetroot gives a pretty pink colour to the dish. It’s best added just before serving. Hot smoked salmon or cooked shredded chicken also work well instead of the mackerel. 1. Remove the skin and any bones from the mackerel and break into chunks. Mix with the beans and tomatoes. 2. Whisk together the lemon juice, oil and honey and season well. 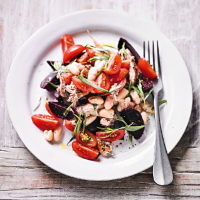 Toss into the salad with the beetroot and tarragon. Lovely served with crusty bread.